The first piece of Tour Series 2016 comes to Taiwan, an eastern Asian nation on the crossroads of her fate. With China’s increasing aggressiveness, Taiwan’s economy, defense, and the whole way of life with democracy and de facto independence, is under huge threat. The good news is, the national identity as Taiwanese rather than Chinese has never been stronger. This is especially seen among the youth, who showed their determination to step towards a free, democratic, and most importantly, independent nation. On January 16, 2016, Taiwan held the fourth general election. 18 million eligible voters can select their president and all 113 parliament legislators. Since the bad performance of incumbent Ma Ying-jeou administration, it is highly likely that Kuomintang would experience another landslide failure against DPP (Democratic Progressive Party) after the 2014 local elections. And it turned out without surprise, Tsai Ing-wen, the Chairwoman of DPP who failed four years ago, won with 56.12% popular votes, 1.8 times the vote got by Kuomintang nominee, its Chairman Eric Chu. And it was also the first time that a non-Kuomintang party won the majority in Legislative Yuan (Taiwan Parliament), DPP caucus won 69 seats, Kuomintang only 35, while four years ago it was 40 vs. 64. As a result, DPP’s Su Chia-chyuan became the first non-Kuomintang President of parliament ever in history. It was the first time that a real “Taiwanese” party had beaten Chinese nationalist Kuomintang and won the power in both administrative and legislative branches, as well as local governments. Taiwanese finally made their day. And Dr. Tsai has become the first female head of the state in Asia without a political family background. The 2016 election was of no suspense and former President Ma Ying-jeou should take credit for it. During his two terms, especially the last three years, Mr. Ma, with his deeply rooted Chinese nationalism, was very talented in igniting the anger of people, especially the youth, by pro-China policies. In June 2013, Ma administration signed the CSSTA (Cross-Strait Service Trade Agreement) with China. The agreement opens Taiwan’s market to China’s investment without equivalent open of China, which will endanger the survivorship of many small and medium enterprises in service industries of Taiwan to a large extent, and make job opportunities outflow much easier. Since his inauguration, Ma’s pro-China economic and trade strategies have already made Taiwan’s economy worse with negative income growth rate and higher unemployment of the youth, and the CSSTA will make things much worse. And the whole process of negotiation and details of the agreement was in “black box” while the Kuomintang deliberately avoided the CSSTA being discussed in Taiwan society. Which is worse, Kuomintang legislators passed CSSTA in parliament in a really brutal way on March 10, 2014. This finally ignited the anger of young Taiwanese which has been suppressed for a long time. 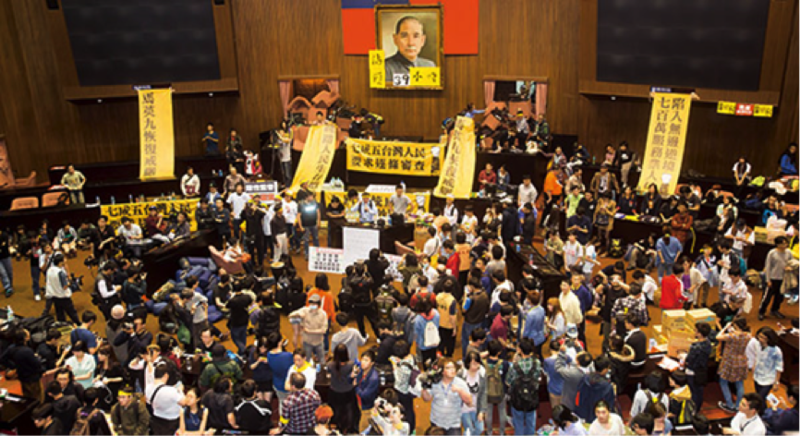 Then came the world-famous “Sunflower Movement”, activist groups and college students occupied the parliament for 24 days. On March 30, 500,000 gathered on Kaidagelan Avenue (Taiwan’s Pennsylvania Avenue) to protest Ma’s kowtow for China’s economic unification strategy. Sunflower Movement marked that Kuomintang was no longer popular among Taiwanese. As a result, Kuomintang lost power in most of cities/counties in local elections on November 29, 2014. This further exacerbated the internal conflict in Kuomintang about whether the party should appeal to Taiwan nativism or be a more loyal puppet of China. And the party never found a reasonable solution but went on the oriental court infighting for the leadership power and presidential nominee. Hung Hsiu-chu, a choking spicy “pepper” with strong anti-democratic tendencies, represented the most pro-unification “Dark Blue” wing and won the nomination first. But her “United in One China” platform made her unable to even be considered seriously in election. Eric Chu, Kuomintang’s then-Chairman, replaced Hung’s nomination with himself after repeated political calculation. Right at this time of chaos, President Ma Ying-jeou flew to Singapore for the Xi-Ma meeting, telling nearly no one in advance. In the meeting with Chinese president (and the head of Communist Party) Xi Jinping, Ma emphasized the “One China” policy, coordinated with Xi trying to block Taiwan into China’s ambition (read my review to know more about Xi-Ma meeting: http://www.michiganreview.com/xi-ma-meeting-a-last-ditch-attempt-to-block-taiwan-into-one-china/). Ma considered these pro-China & anti-Taiwan actions his legacy.ll these led Kuomintang to further slide into the role of China’s Trojan horse in Taiwan.